3. purpose of votes in the quorum. Refer this article for quorum models/votes. 1. Flexible Failover Policy – Before SQL 2012, the failover used to be dependant on Isalive and Looksalive checks done by resource DLL and there was very less control with the administrator except changing the timeout values of the above two parameters. Starting SQL 2012, the administrators have more control as there’s an option of flexible failover policy. 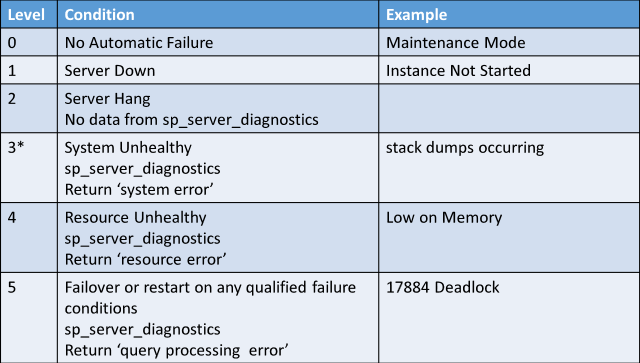 The resource availability is now being checked using sp_server_diagnostics and failover can be customized depending on the level selected. Just to setup the base, AlwaysON FCI is a SQL Cluster as HA solution which needs shared storage to function. The disk ownership stays with the primary node and as soon as the failover happens, the storage ownership changes to the current active node. 3. Another enhancement in AlwaysON FCI is, Multi-subnet cluster. With SQL server 2008 R2 FCI – there was no option for cluster based on IPs from the different subnets. To build Multi-site cluster, stretched V-LAN was required. All the nodes from the cluster had to be mapped to this V-LAN. After the failover the same IP address was taken over by the node in the different subnet. However, SQL 2012 onwards, multi-subnet cluster is supported with multiple IPs and the resource dependency for the virtual network name can use ‘OR’ relationship on these IPs. 4. Clustering on SMB fileshare and CSV storage – SAN is not the only option for shared storage for AlwaysON FCI now, SMB fileshare and CSV storage can also be used to build the SQL cluster. 5. Domain independent availability groups – Starting SQL 2016, SQL cluster nodes can reside on different domains or even no domains at all using Windows 2016.Imagine the cluster in workgroups that’s really cool. Please find the PPTs for this session attached. I will write about AlwaysON in the next post.